Today: A wedge salad that's actually worth bringing out your knife for. As a general rule, if salad leaves are chopped, I prefer them bite-sized. I've already gone to the trouble of cutting (or tearing) them once, why bring a knife back into the mix once I'm at the table? A quick look around the internet shows I'm not alone. Those in favor of eating salads with knives are outnumbered by advocates of just diving in their with hands. But even a fork-only stalwart like me can see the appeal of the occasional wedge salad. As long as we observe a basic level of table manners, we should all be free to tackle a plate of vegetables however we see fit. More: Brush up on your basic table manners. And there is something incredibly satisfying about digging into a triangular slab of lettuce. Or cabbage. In this case, I went with Napa cabbage, cut into wedges. 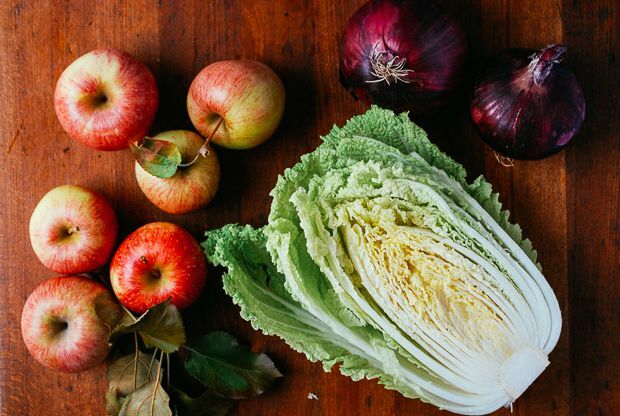 While green and purple storage varieties will be kicking around until spring, Napa cabbage has a short spring season and then peaks in the fall. 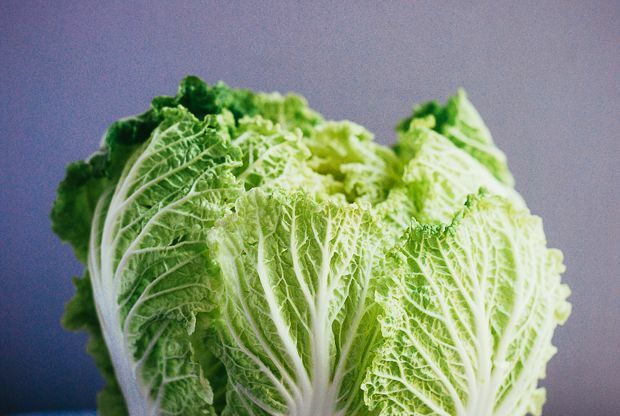 The combination of a crisp, pleasantly watery bite, a hint of spice, and the robust cabbage-y flavor makes Napa quite the treat. Here, it's paired with sliced apples, fresh from a trip to the orchard, and thinly sliced red onions. A rich buttermilk and Parmesan dressing marries all those pronounced flavors for a balanced (and super crunchy) fall salad. 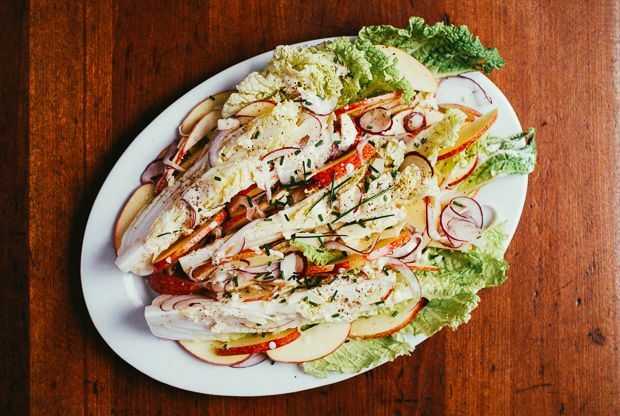 Since a proper wedge salad is all about presentation, you'll want a creamy dressing that's up to the job. To ensure the dressing is thick enough, add each ingredient one at a time, and whisk vigorously to maintain emulsion. I love the fall twist on this salad! We tried this the other night and it was great! We did make a slight change and added a shallot to it rather than the red onion. Will make again. Hi Lisa, Thanks so much for dropping by and sharing your experience! I love shallots and can imagine that they'd add a great depth of flavor, as well as their trademark zing, to this salad. Really glad to hear you liked it. Fresh Napa from the Farmers and just picked up my organic dairy order with buttermilk. I opened this site looking for a salad idea and there you were! Thank you this is perfect. Hi Annie, That is so cool. I'll *try* not to be too jealous of your farm fresh buttermilk. Enjoy! so clever using cabbage as the wedge, as opposed to the ubiquitous iceberg! much love for this recipe, elizabeth! Thanks for the kind words Lindsey! I grew up with iceberg as the only lettuce and am just not a fan. This looks stunning. Need to make it ASAP. Thanks Sara! I hope you get a chance sometime soon. Glad you stopped by!